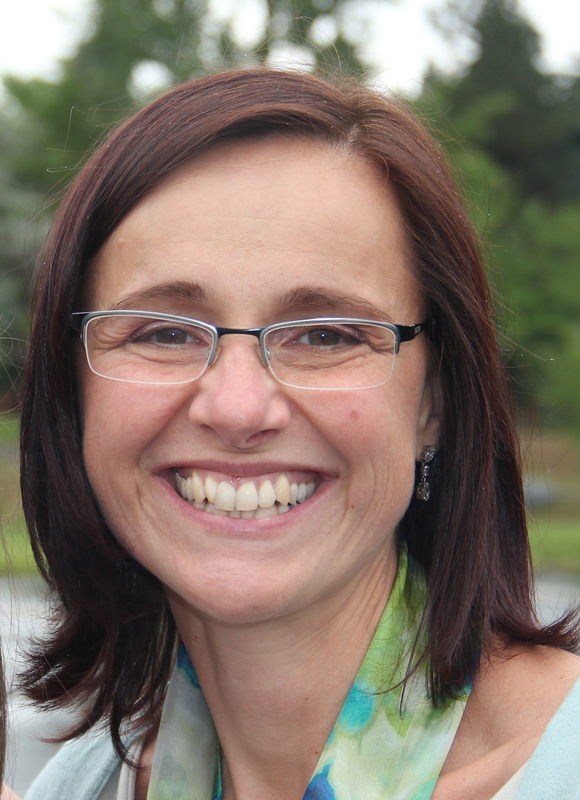 Mirna, my sister-in-law or ma belle soeur, as we fondly regard ourselves, never ceases to amaze me with her culinary creativity. Ma belle soeur, Mirna, the culinary visionary. 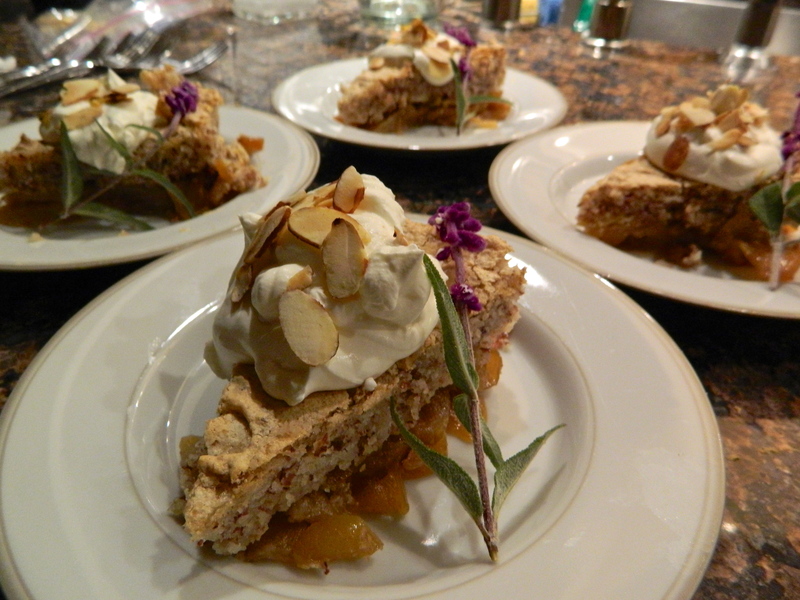 While visiting Denver a few weeks ago, as I do every autumn, Mirna shared with me a recipe she devised that is gluten-free, full of apples and delicious. It all started with a visit to a French bakery and bistro nearby. Pierre Michel, a tiny unassuming authentic French bakery tucked into a shopping center, bakes up a buttery, crispy croissant stuffed with thick, sticky almond filling. 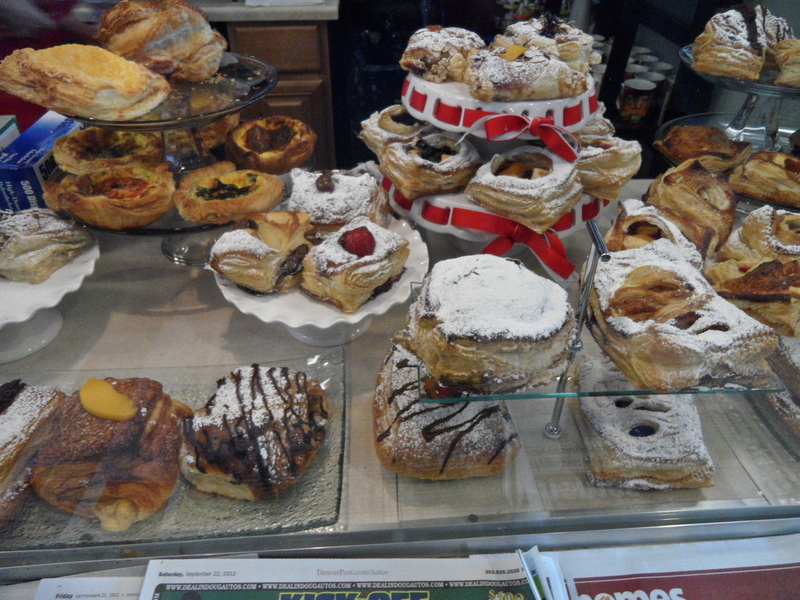 Rich and buttery breakfast pastries baked by a true artist. Curious about how to make our own almond filling, we experimented with grinding whole almonds with a rotary cheese grater. The results were perfect but oh, the work involved. Buying almond meal made more sense. Our conversation moved from croissant filling to another French almond cookie, the macaroon. Inspired by its delicate crunchy texture which dissolves on the tongue, Mirna wished to deflate the sweetness. Traditional French macaroons are sandwiched with rich ganache, Crème Chantilly or other filling. To us, they become so sweet that you can just have a bite before your face curls and your brain reacts to the sugar overload. The challenge: how to substitute fruit for the ganache and cut the sweetness. 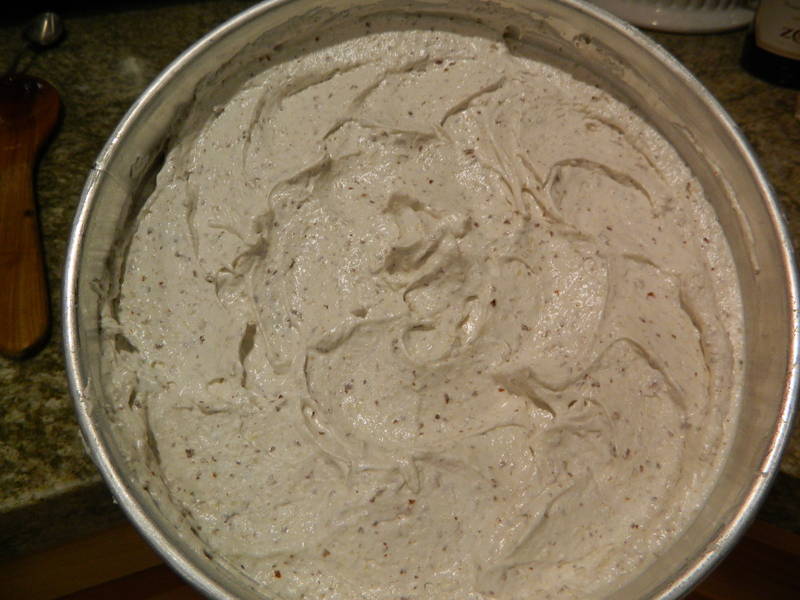 Her solution to the macaroon sandwich was to prepare a meringue, then fold in almond meal. A fruit layer below the meringue would soften the sweetness. Voila! This topping bakes up like a moist cake with a macaroon feel to it and is the perfect marriage for sautéed fruit. 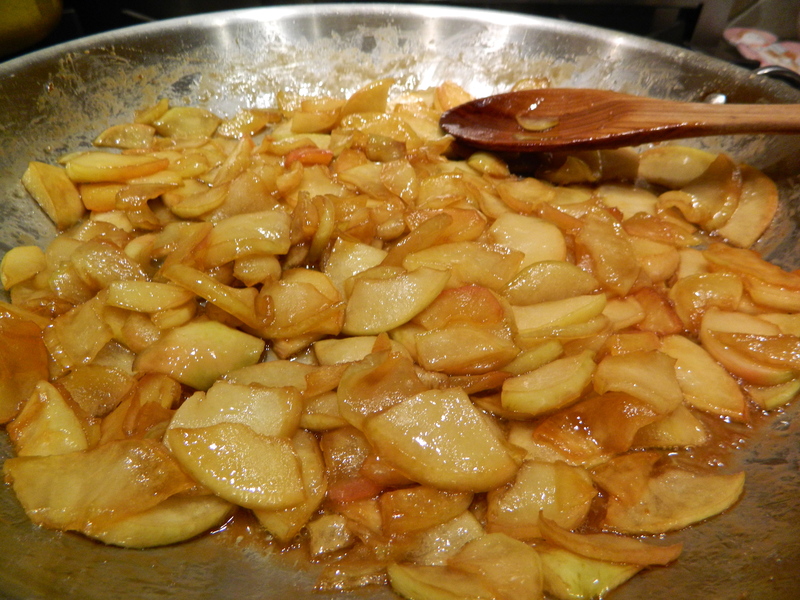 We used apples but it would be delicious with plums, cherries, pears, even fuyu persimmons which I plan to try. It is simple to make and as I found out last night when I took it to a dinner party, a real crowd pleaser. Beginning the sauté process. I love the tart and sweet Honey Crisp apple variety. See how the apples take on the caramel appearance. You can add as many apples as you like. I prefer a thin layer to just highlight the main actress – the meringue topping. 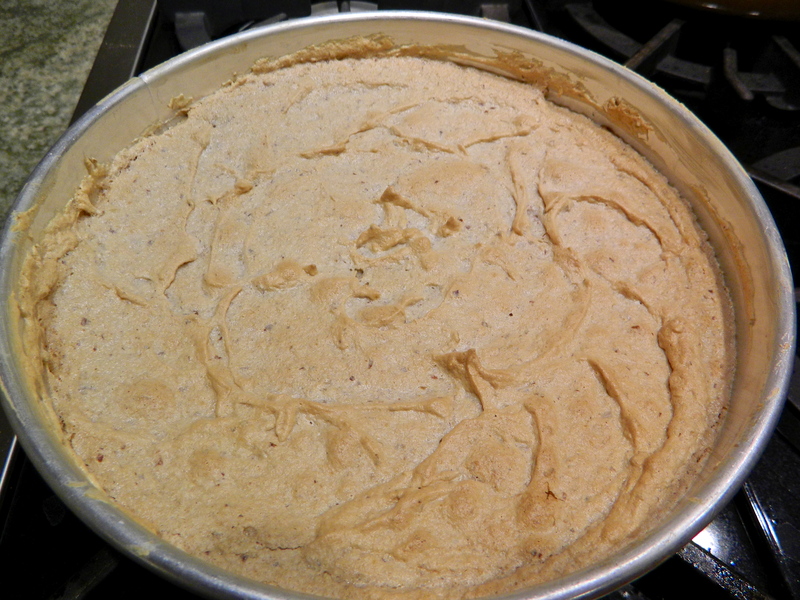 A gentle fold of the almond meal into the meringue helps keep its shape. Bake until golden brown 35-40 minutes. I made one dessert with convection and one without. No difference. 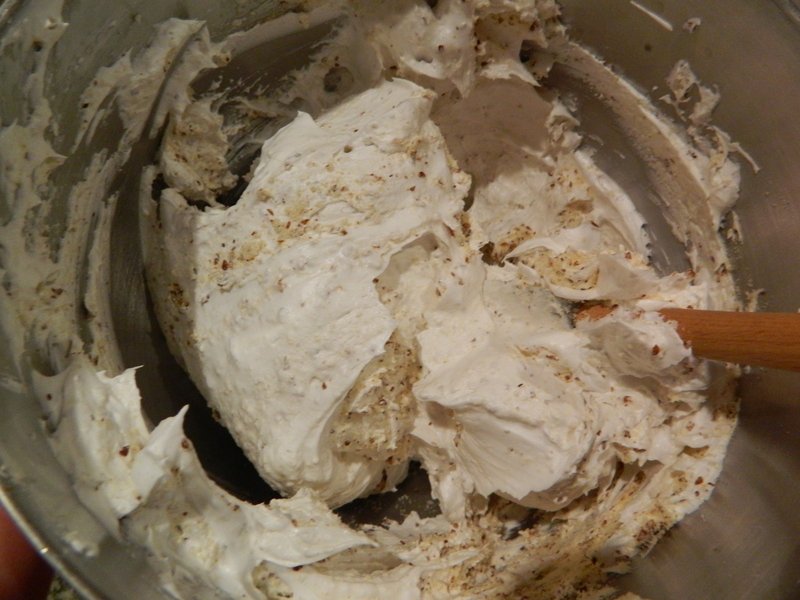 I finished the cake with a dollop of a crème fraiche/whipped cream mixture, then sprinkled toasted almonds on top. A sprig of Salvia from my garden gave color. * Almond meal or flour is available at Trader Joe’s, Whole Foods, Bob’s Red Mill, Sprouts and King Arthur to name a few. Melt the butter in a large sauté pan. If you wish, you can use an iron skillet and bake the dessert in the pan. 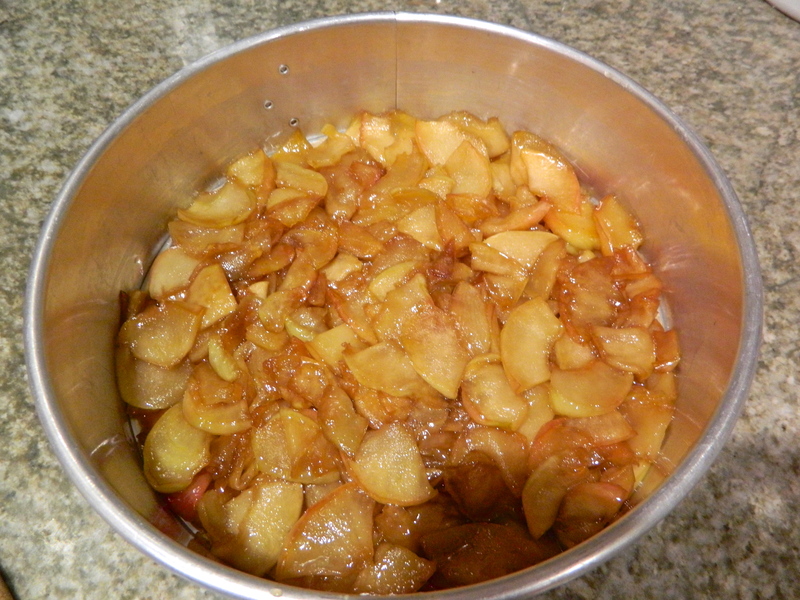 Add the sugar and salt and cook while adding the apple slices. I don’t peel the apples but feel free to peel away if that is your preference. Note: while taking a chocolate making class years ago, I learned that a pinch of salt added to sugar and butter helps to keep the butter from separating from the sugar. This also works well when making English Toffee! 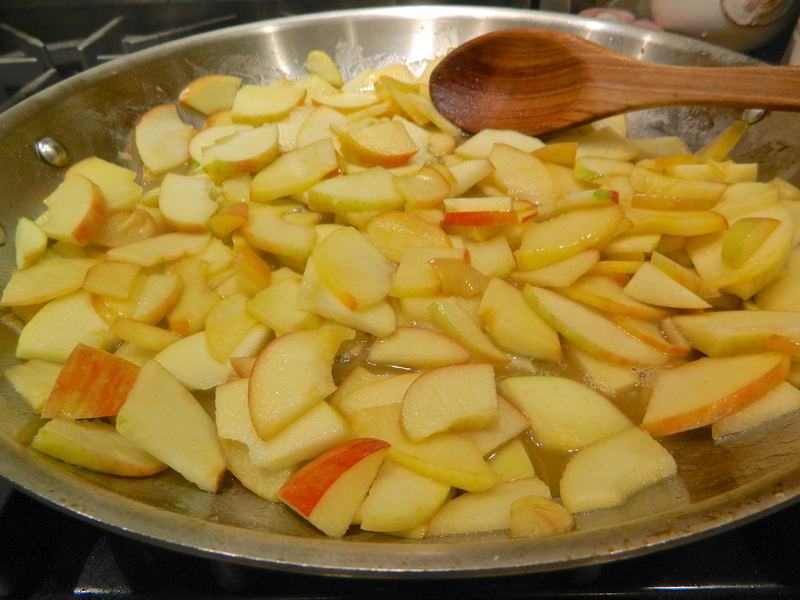 Sauté the apples until soft and the liquid begins to evaporate. This will take about 15 minutes and create a caramel sauce. Pour the apples into the springform pan. Pour the clean egg whites into a mixer fitted with a wire whisk. I love the Kitchen Aid my Grandmother purchased for me over 30 years ago. Beat on medium speed until the whites pull together and begin forming soft peaks. Drizzle the sugar in slowly, stopping to scrap down the sides from time to time. When all sugar is incorporated, beat at high for about one minute. Beat in the almond and vanilla extracts. Take the bowl off the mixer and gently fold in the almond meal, in thirds. Do not overmix! Spoon the meringue over the apples (I have spooned over both cooled and warmed apples and there is no difference in results!). With a spatula, swirl the meringue artistically to create a design. Cool for 30 minutes, then release the springform side. This dessert can be made the day before, as I did, or served warm. I love how it slices and holds its shape. A garnish of half whipped cream and half crème fraiche, topped with sliced almonds gives it a finished and professional look. Thanks to you Mirna for taking the macaroon to new heights! This is one of my favorite new recipes and I will be seasonally changing out fruits for years to come. It is the perfect company or dinner party dessert! !